The Homeschool Gossip: Demo the New Game INTELLE with its Creator on Monday ~ Concord! Demo the New Game INTELLE with its Creator on Monday ~ Concord! The Homeschool Gossip had the privilege to demo the game INTELLE and it was GREAT!! You can have a chance to demo the game with its creator, David Abelson, before INTELLE's Kickstarter campaign on Monday 10/2/17 at The Mighty Meeple from 7:00 - 9:00 PM! 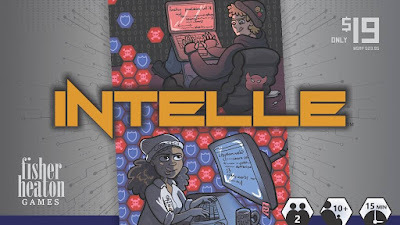 David Abelson is launching the Kickstarter campaign to fund the creation of his game INTELLE on October 10th. If you are available, please join us as we gather and play games and celebrate this momentous occasion for David and for Fisher Heaton Games. Intelle is a cube placement, area control strategy game for 2 players. One player is the Black Hat - a cunning hacker determined to infiltrate and bring down the Corporation. The opposing player is the White Hat - employed by the Corporation to protect its valuable data. Players take turns strategically placing blocks of code with intent to control the various systems of the Corporate mainframe. ​Control three adjacent systems before your opponent to either infiltrate or protect the Corporation and win the game!